The AquaKnights wrapped up a successful season at the GHSA 1A-5A State Championship meet this past weekend. Out of 56 schools in the 1A-3A divisions, the boys finished 12th, and the girls finished sixth. The boys and girls advanced to nine finals events overall. Pace's performance can be summed up with simple math: 5-4-3-2-1…. five records set, four medals earned, three state-champion titles, two state champions and one All-American. The meet kicked off with the diving competition, where reigning state-champion diver sophomore Lizzy Kaye secured her second consecutive state-champion title! She dominated the competition from her first dive and never looked back, scoring over 95 points higher than the next closest competitor in the 1A-5A meet. She becomes the state record holder with over 611 points, more than 40 points ahead of any other diver in the girls 6A-7A meet. Kaye finished her sophomore year undefeated, with All-American consideration and every Pace Middle and Upper School diving record. She also became the first Pace student-athlete to qualify for the state championship in both diving and an individual swimming event. 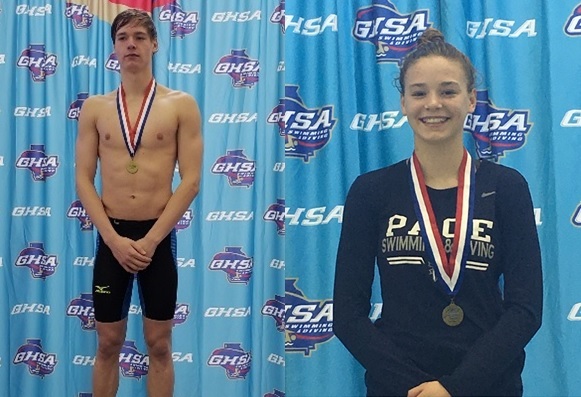 The swimming competition was led by senior team captain Charlie Kaye, who set three new Pace records, achieved an All-American time, two All-American consideration times, and won the state-champion titles in both the 100 freestyle and 100 backstroke for the second year in a row. Kaye's lead-off leg in the boys 4x50 freestyle relay also set a new Pace record. Standout junior Erin Hood excelled in her races all weekend, earning a spot on the podium with a third-place finish in the 200 IM and a personal-best time. Hood also had an impressive fifth-place finish in 100 breast stroke with another personal best. In relay competition, the girls 4x50 freestyle relay of Hood, L. Kaye, junior Meghan McMillin and sophomore Amalie Little finished fifth with a new Pace record. Hood, L. Kaye, McMillin and Little also swam in the medley relay to a fourth-place finish. The girls 400 freestyle relay team of McMillin, seniors Luisa Whitney and Sophia Lochan, and sophomore Isabel Battista had a strong showing with a 10th-place finish and personal-best swims for all. The boys medley relay of C. Kaye and juniors John O'Brien, Jason Rosenbloum and Dillon Carroll finished in 10th; these four swimmers also came in ninth in the 4x50 freestyle relay. The boys 400 freestyle relay team of Carroll, O'Brien, and seniors Carter Frooman and Cole Campbell raced in prelims and finished just outside of the finals time. The AquaKnights who swam in individual events during prelims were Rosenbloum in the 50 freestyle and the 100 butterfly, L. Kaye in the 100 backstroke, McMillin in the 50 freestyle, and Little in the 50 and 100 freestyle. C. Kaye wraps up his senior season as the most celebrated swimmer in school history. Kaye's achievements include three state titles, All-American status, three-time All-State team member, four-time IronKnight Award winner, two-time team captain, an undefeated dual meet season and 20 school records. Three varsity wrestlers competed at the sectional tournament at GAC on Feb. 1 and 2. Freshman George Blaha qualified at 106 pounds by placing fourth at the area tournament the previous week. Senior Charlie Warren and junior Connor Husk placed fifth at 160 pounds and sixth at 170 pounds, respectively. Since their brackets were not full, they were also able to compete in the sectional tournament and both made the best of this opportunity. Husk wrestled well in his first contest and showed improvement over the previous week but did not advance. Warren pinned his first opponent and then lost a close quarterfinals match to a wrestler from Pike County. In the consolation round, he won his next three matches to advance to the consolation finals against the same Pike County wrestler. This time it was an even closer match, with Warren losing 3-2 on a stalling call in the final seconds. He finished in fourth place and qualified for the state meet. Blaha won his first two matches easily and advanced to the semifinals where he lost to a very tough wrestler from North Hall. He won his next match with a quick pin and then faced a wrestler from Lumpkin County who had beaten him the previous week. Blaha was down 4-1 at the end of the first period but did a great job from the top position in the second period and turned to pin his opponent. He finished in third place and qualified for the state meet. 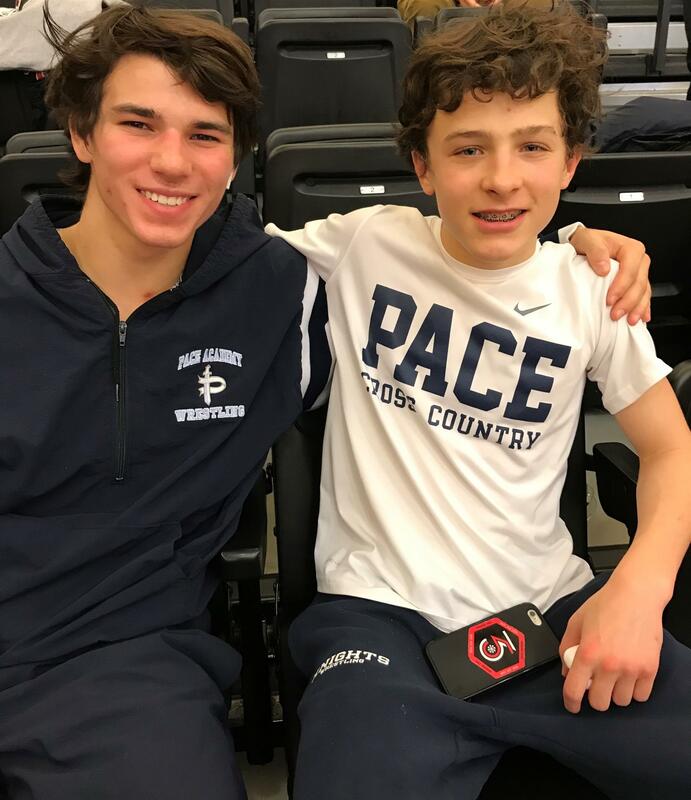 Warren and Blaha will compete in the state tournament Feb 14 -16 in Macon, Ga. 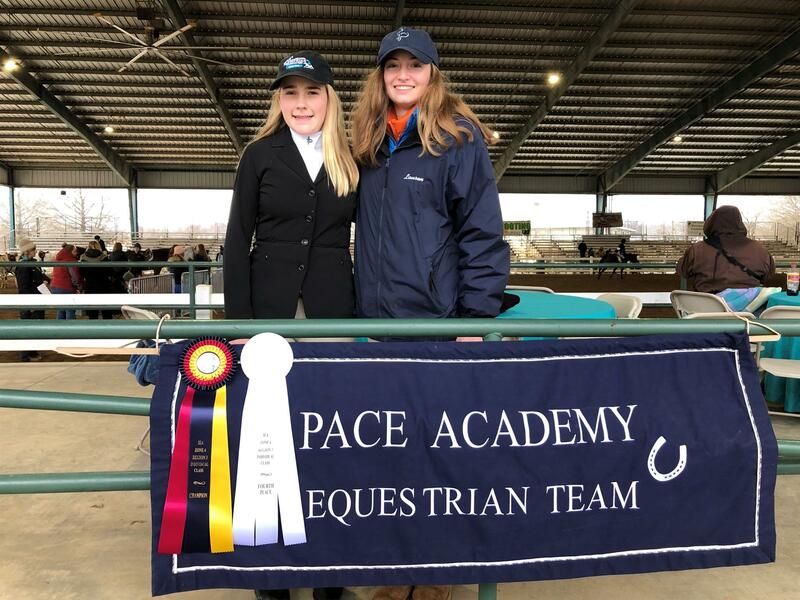 This past weekend, the equestrian team competed in the regional show. Junior Lauren Stebbins placed first overall and advances to Zones, which will take place in Pensacola March 22-24. She was also named the High Point Rider of the show season. Eighth-grader Anna Nuckols also competed and placed fourth at regionals. Good luck at Zones, Lauren! The varsity track and field team competed in the 2nd Annual Haley Kolff Time Trials at Holy Innocents' on Feb 9. With three field events and four running events, the mini meet was a great way to jump-start the season. Junior Kennedy Tate stepped into the top throwing role in the shot-put event. She threw at her previous season's personal record, which placed her first overall. Fellow thrower junior Brianna Thomas wasn't going to be outdone—she pulled out a personal record and placed fourth overall. Junior Grant LaRoux also had a personal record, placing him fifth overall. Senior Justice Jackson and sophomore Laura Romig teamed up for some points in the 300 and 600 meters. In the 300, Jackson was first and Romig third, and in the 600, Romig had dibs on first, while Jackson was runner-up. On the boys side, sophomore Alexander Swann had a stellar race in the 600 to put him on the board with third-place points. Junior Paula Sandoval had a nice showing for fourth in the 1600 meters, and freshman Edward Blaha blasted a 10-second personal record in the 1600 for the runner-up points. 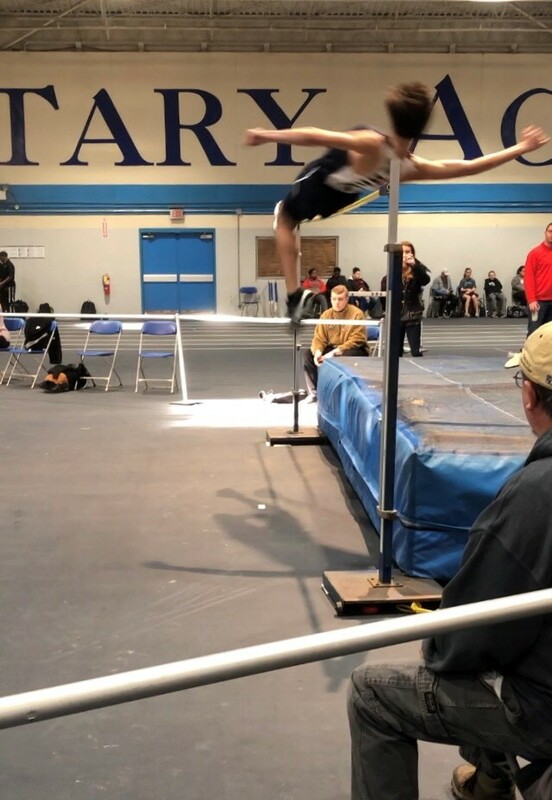 After the results were tallied from the boys high jump, freshman John Catherman was the winner with a jump of 5'8". Several distance runners will compete Saturday, Feb. 16, at the Marietta Distance Carnival. 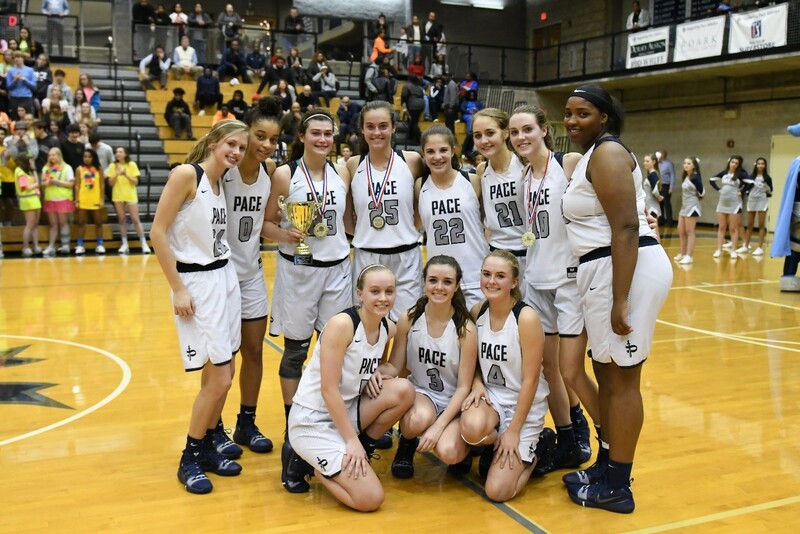 As regular-season region champs, the varsity girls basketball team earned a bye in the first round of the regional tournament before decisively beating the Redan Raiders 39-16 on Feb. 6. The Knights, known for their dynamic defense, did not disappoint their home fans, out-hustling the Raiders and causing 24 turnovers, which ultimately accounted for 41 percent of the Knights' points. The Knights also controlled the boards, led by sophomore Camryn Jones with nine total rebounds and junior Virginia Hobbs with six. Offensively, the Knights were strong, led by senior Joelle Zelony with 10 points, followed by senior Kayla Ross (7), Jones (6), seniors Madeline Janki (6), Ann Rafeedie (5), Paige Fleming (3) and junior Taylor Doucet (2). On Feb. 8, the Knights were excited to play Lovett again at home for the region-tournament title. Before a packed house, the competitiveness of the two rivals was felt by all as the lead swung back and forth in the beginning, and the Knights edged out the Lions with a 1-point lead going into the half. Early in the second half, the Lions gained momentum as more shots started falling, but the Knights always responded by battling back and dominating the boards. They were led by Zelony and Hobbs with seven a piece. Zelony also led offensively with 13 points, followed by Ross (10) and Hobbs (8), but in the end, it just wasn't enough to pull it off, and the Knights lost 48-42. "It was awesome to see so many students and parents supporting the team. I wish we could have given them the win, but it wasn't for a lack of effort," said varsity basketball coach Dr. Troy Baker. Ann Rafeedie, Joelle Zelony and Kayla Ross were named 1st Team All-Region (5AAA). The girls are now preparing for the state playoffs. Come out and support them in the Inman Center this Friday, Feb. 15, at 5:30 p.m., when they play the East Jackson Eagles in the first round! The Knights need your support as they attempt to advance to the GHSA AAA Sweet 16! This past week marked the start of the postseason for the varsity boys basketball team. The Knights finished the regular season 9-3 in the region, and three Knights—Madison Durr, Reign Watkins and Josh Reed—were named to the 5-AAA All-Region team. 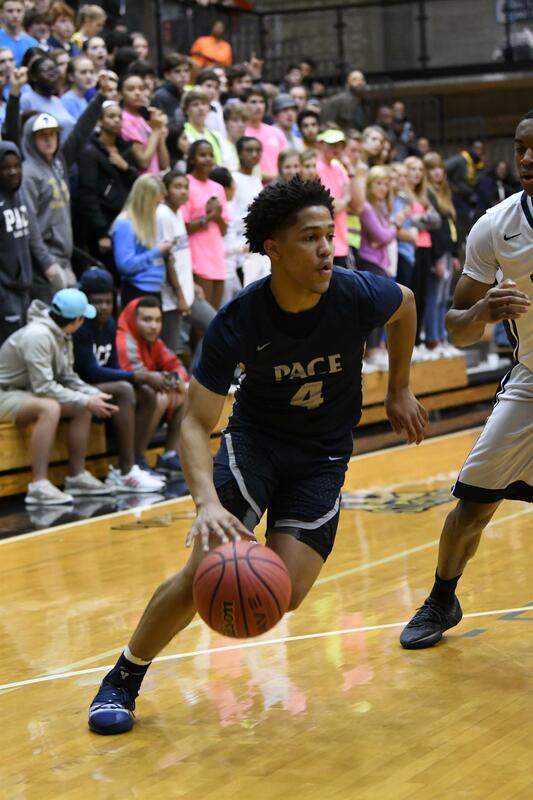 The Knights hosted the region tournament in the Inman Center but unfortunately came up just short of the region title; however, the Knights put on a great show for a big crowd in the final game. The week started with the Knights facing Towers, and the Knights took care of business, winning the game 57-43. The Knights were led by Durr, who finished with 13 points, going 6-9 from the field, and sophomore Justin Johnson, who scored 12, also going a perfect 8-8 from the free throw line. The Knights scored 17 points from Towers turnovers and were strong on the fast break, scoring 13. In their second game of the tournament, the Knights faced the Redan Raiders and carried their hot streak from the previous game into this one. The Knights outscored Redan 17-6 in the first quarter and led all the way to the end, winning the game 51-37. The Knights received a strong effort from Watkins, who scored 18 points and had a great night from the free throw line, knocking down 10 in 13 attempts. Freshman Josh Reed also had a strong night from the field, scoring 12 points and grabbing six rebounds. In the region championship, the Knights faced Cedar Grove in front of a packed house in the Inman Center. Watkins led the Knights, scoring 18 points for the second straight game. The Knights capitalized on Cedar Grove turnovers throughout the whole game, scoring 16 off of 12 Cedar Grove turnovers. Unfortunately, the Knights lost 48-43 in overtime. The Knights now enter the state tournament and will face Hart County on Saturday, Feb. 16, at 3 p.m. at home in the Inman Center.